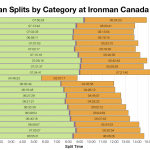 Ironman Canada is the final Ironman from the weekend. 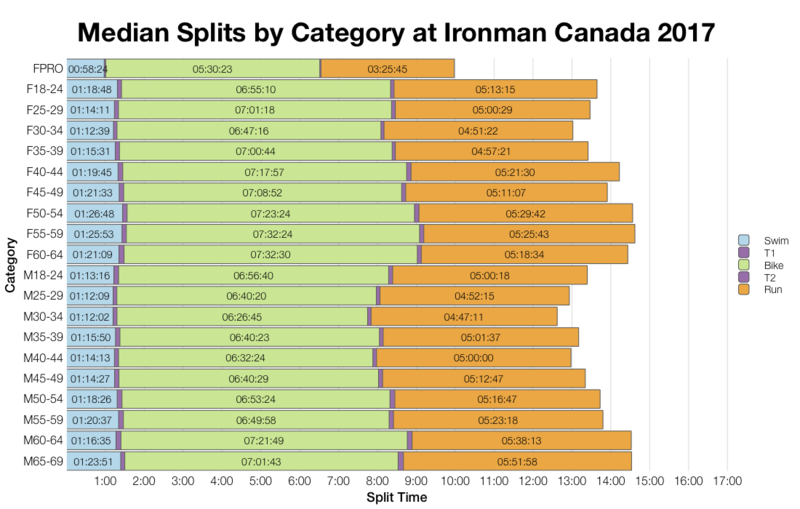 Although Ironman has been in Canada for a very long time, this particular course is 6 years old. It’s a relatively small event with a field of around 1250 athletes competing for 40 Kona slots. 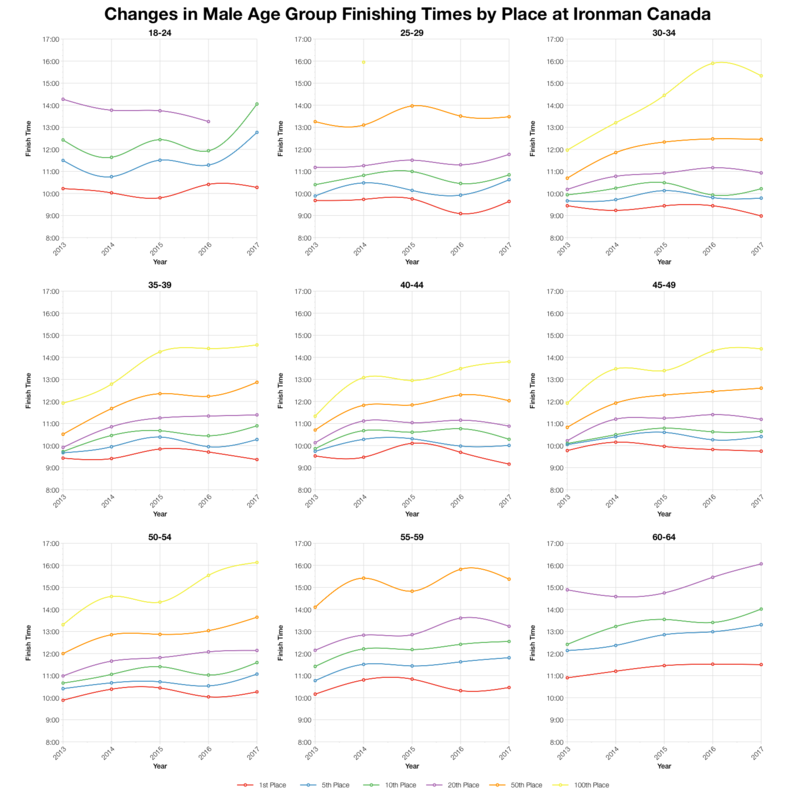 With the exception of the swim, this year’s race trends slower than the previous 5 years of results. The overall difference is quite small, this isn’t a significant change for the race. 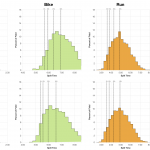 Perhaps the most notable element of the distributions is the double peak on this year’s bike, a division between those finishing under 6:15 and those after 6:45. Allowing for the variations in results reporting meaning some years contain DNS data we can still place the 2017 results somewhere in the middle based on bike and run DNF numbers. 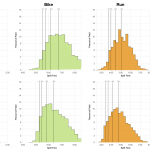 The median charts repeat the distributions pattern of slower splits for bike and run at this year’s race. 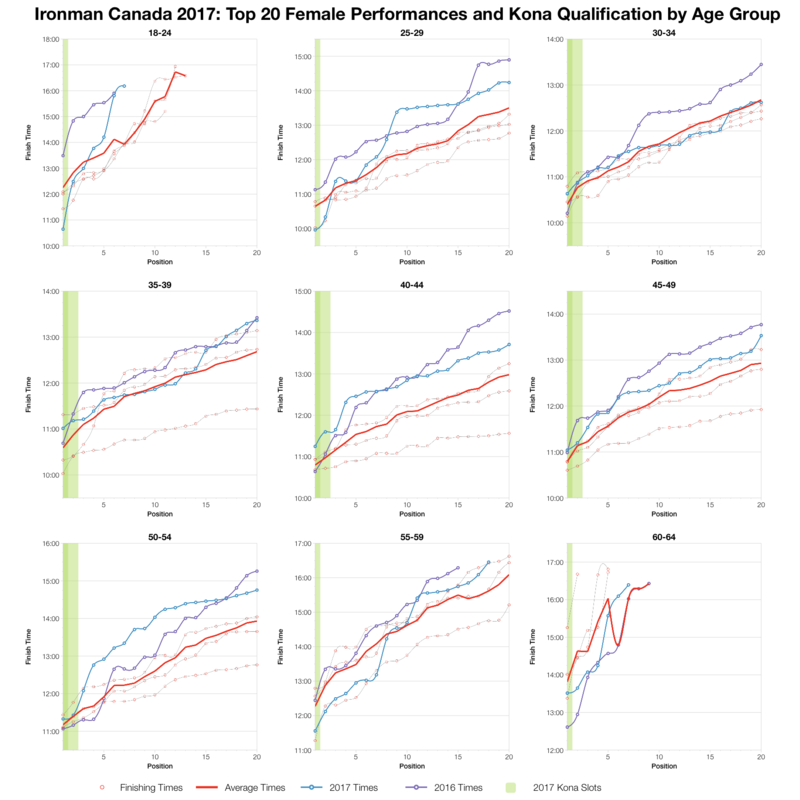 2017 is consistently slower for both bike and run than its predecessors. Canada naturally has a predominantly North American competitor base who take their share of the slots on offer. 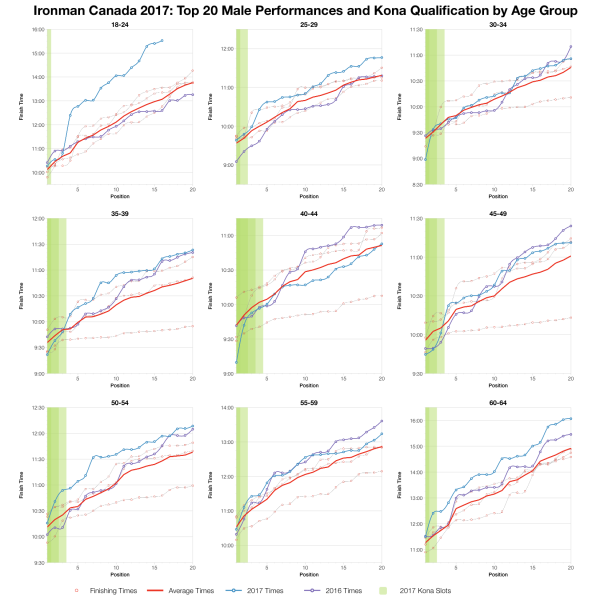 Tracking age group positions over the 6 years of racing places 2017 somewhere in the middle. 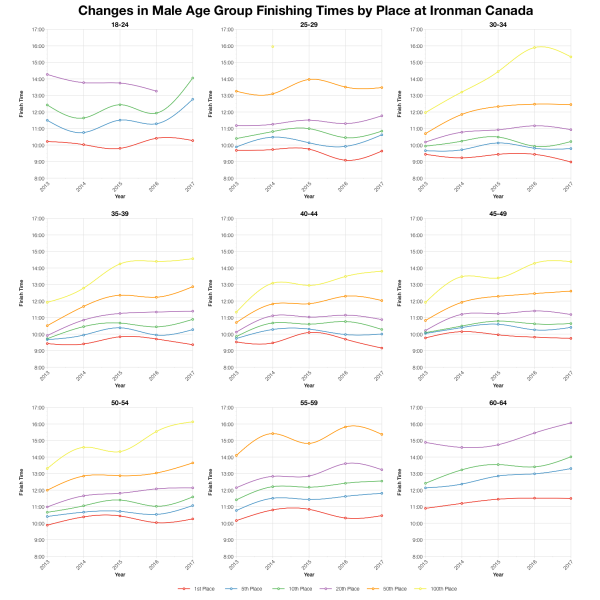 There’s quite a lot of variation between age groups and placings, not every one slowed down. Times tend to lie somewhere in between results from previous years. 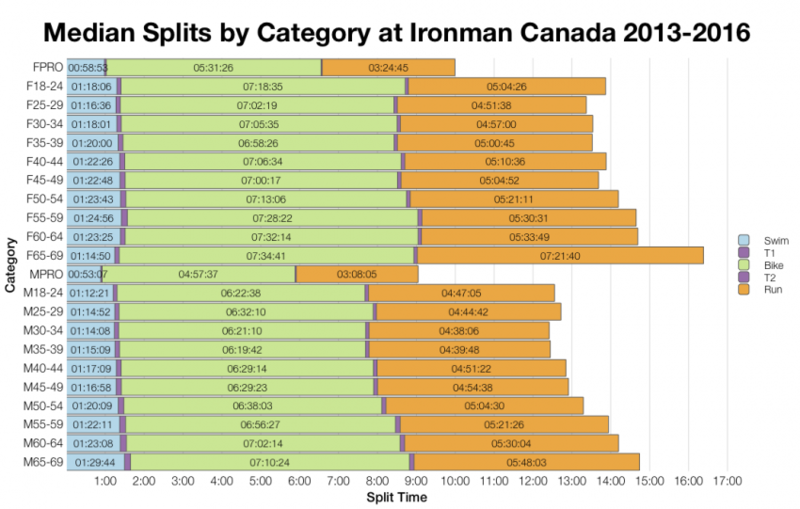 Based on the results list I’ve estimated the distribution of slots used for Canada and from that the automatic qualifying times they give. As always, the actual allocation may have varied and roll downs would influence the qualifying times. For more details on qualifying times check out my Kona qualification page. Finally, the age group top twenty times. 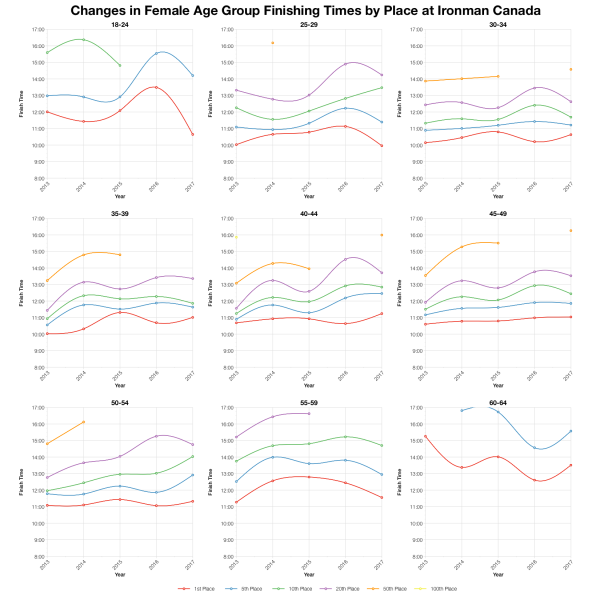 Again we see variation with some age groups, generally the larger ones, trending closer to the averages than others. 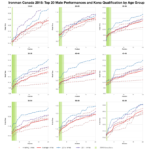 I would say these charts still put this year’s race as slightly slower than the norm though. 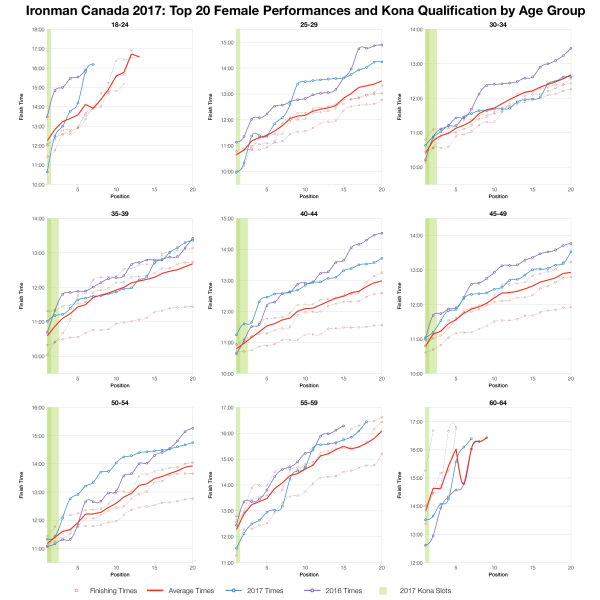 You can access a spreadsheet of the full results from Ironman Canada 2017 on my Google Drive.